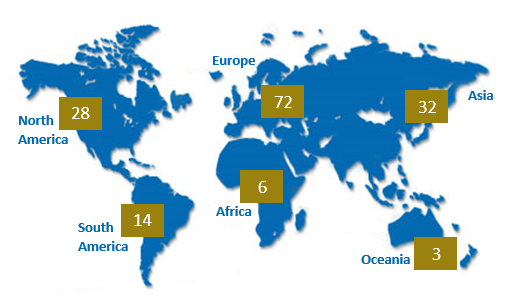 The Louvain School of Management, since 2006 Equis accredited, has around the globe over 150 partnership agreements with worldwide partner institutions in 47 countries. Key strategic alliances are CEMS and PIM, consortiums of leading international business schools. We collaborate with institutions to open opportunities, new horizons and prepare for an increasingly globalised jobs market. Student life is about gaining knowledge and we encourage all students to experience inter-university exchanges. > We offer our students* the wonderful opportunity to stand-out with one of the three LSM Premium Programmes (UCLouvain grant available). Achieved many high management skills to start in top level responsibilities. Embedded into the LSM master 120 credits, the CEMS MIM is a designed Master in International Management. Top 10 in FT Ranking, it is led by 30 top World's Business Schools and 75 Corporate Partners; among the 30 top World's Business Schools, the LSM is the unique Belgian CEMS School. Become an expert in a specific management field by graduating from... two Master's degrees ... in 2 years. Be prepared to an international career. * registered in one of the LSM Master 120.